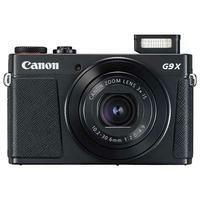 The Canon PowerShot G9 X Mark II Digital Camera in black packs a large 20.1-megapixel 1.0" type sensor and a bright f/2.0-4.9, 3x optical zoom lens into a stylish, pocketable camera with DSLR-like control. With its simplistic button layout, Lens Control Ring and 3.0" touchscreen, users can enjoy more creative control and intuitive operation when capturing stills and recording Full HD 60p movies. What's more, built-in Wi-Fi with NFC makes it easy to connect to a smart device and share your creations online with family and friends. Wrist Strap (WS-DC12), Battery Pack (NB-13L), Battery Charger (CB-2LHE), AC Cable and User Manual kit.